Comic-con Episode IV: A Fan’s Hope is a light-hearted documentary film developed by Morgan Spurlock (Supersize Me, Fast-food Nation) and presented by the venerable Stan Lee and Joss Whedon. The film is presented in classic documentary format with a mixture of hand-held footage, giving a behind-the-lines insight into the atmosphere of the event, and cameo monologues by various icons of the commercially booming ‘nerd culture’ that looks like a stifling convergence of Indy, gamer, comic-book, cos-play, and sexualised Japanophilic teddy bears – with an honourable mention to the growing prevalence of aspiring glamour models that are all totally L33t. 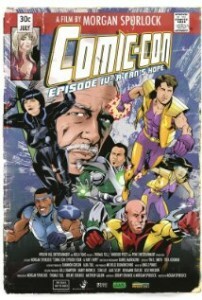 Within this format ensues a broad narrative following the parallel stories of six Comic-con attendees and their various quests. Two artists intend to wow industry professionals with their portfolios in order to break into the industry; a man who met the love of his life through the convention concocts an elaborate plan to take it to the next level; an aspiring costume designer sets her sights on the cos-play championships; a pathological hoarder (sorry, I mean collector) spends TWO F*CKING DAYS in line for an 18 inch Galactus figurine; and a pioneering OG of the scene laments the growing lack of emphasis on the comic element of the event’s title. Spurlock edits this tale into a tight 83, offering much of a muchness in regards to style and story following the formula he’s successfully road tested in his previous work. That being said it is crafted in a way that makes it, at its heart, a feature length human interest story. It provides a relatively sincere portrayal of geek culture, despite its moderately down-played treatment on the extent of corporate influence in the event. This too, however, can be forgiven because the characters introduced are undoubtable real and, regardless of your opinion of their life-styles you can’t help but empathise with the yearning they so clearly convey throughout. This is a movie that is fun. As a fan of the genre I enjoyed it. The engaging presentation of its subject-matter ensures it will draw interest from enthusiasts and passers-by alike. There’s much worse ways to spend 83 minutes – 90 if you include credits, but who does that. Extras include sixteen extended interviews with industries mainstays such as Kevin Smith, Joss Whedon, Felicia Day, and Ellen Page. Whilst only optional viewing, this stand-alone addition provides some interesting opinions and personal anecdotes about the convention, making it a thoughtful Easter-egg inclusion for the more diligent enthusiasts out there.